A consummate fly fisherman Alan has searched for every major subspecies of trout and salmon in North America and spent many Summers exploring the famed waters of Colorado, Montana, Idaho, and Wyoming. For 10 years he had a permanent campsite on the fabled waters of the Beaverkill, Wiilowemoc and the Delaware Rivers of New York- the birthplace of American fly fishing. He has fished every continent except for the Arctic and Antarctic. Fishing has been almost as much of an obsession with Alan as his Art. To a large extent, the basis of his art has been to experience and understand the creatures he draws. "If I can "see" it I can draw it. An artist needs to internalize his subject and feel it breathe, feel its heart beat, and be in awe of their spirit before he will ever have a chance to capture it on paper." 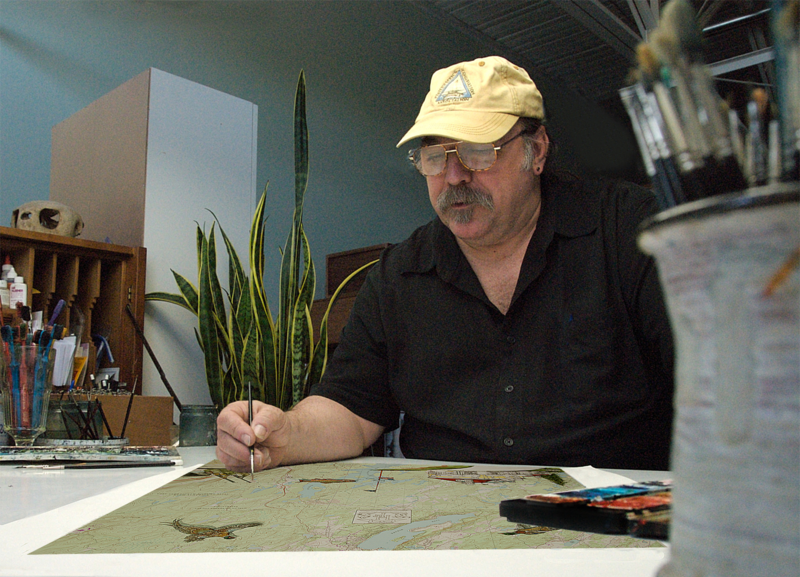 His fascination with maps and charts has led him to become a Business Partner with the USGS and a NOAA chart vendor for many years. Understanding the habitat of the creatures he portrays further helps to understand his subjects. Commissioned as an illustrator, Alan's images have appeared in various publications and magazines for Disney, Chronicle Books, Random House, Knopf, Lyons Press, Fly Rod and Reel, Safari Press, Sporting Classics, National Wildlife, Gray's Sporting Journal, The Fisherman, Fly Fisherman and Yankee Magazines. Although he rarely works in any other media but pencil and watercolor now, to this day Alan doesn't consider himself a watercolorist. "I am a draftsman, draw with color and have developed my own style." Alan holds a Masters of Fine Arts in Printmaking (Etchings and Wood engravings primarily) and Sculpture from the University of Massachusetts. Recognized for his talent as a master printer and designer in the fine art of bookmaking, Alan's images have graced the pages of 28 limited edition letterpress books honoring the natural world and its creatures. He designed and published these books by his Cheloniidae Press included several piscatorial titles; Gamefishes, Saltwater Grand Slam, Trout & Bass, Brown & Rainbow, Trout & Bass and Atlantic Salmon-Once and Future King. Birds & Beasts of Shakespeare, Tortoises by D.H. Lawrence, A Fowl Alphabet, An Odd Bestiary and The Raven by Edgar Allen Poe are just a sample of his other titles. He has been enlisted as a judge for the American Institute of Graphic Arts. His book "Here is the Arctic Winter" published by Disney's Children's Book Division, Hyperion Press, was published in four languages. His work enjoys wide appeal among disparate audiences from children and adults, to outdoor enthusiasts and collectors alike including Prince Charles, Charles Schwab, Johnny Morris, and former French President Francois Mitterand. Clients have included Orvis, L.L. Bean, BassPro, Robert Kennedy Jr., Baykeepers, Museum of Natural History-NY, Monterrey Bay Aquarium, Trout Unlimited, Pier One, Coastal Conservation Association and Erica Jong to name a few. His work has won numerous awards and have been included in over 125 national and international art competitions including First Place at the National Academy of Design in NY. Alan's books and artwork are in major collections around the world including the Boston Public Library, New York Public Library, Folger Shakespeare Library, National Library of Australia, Kings Library, Canada, and the Meisei University Kadama Collection, Japan. Quote about Alan's work by Booker Prize winning Author, David Profumo, "Alan James Robinson, an American Artist, manages to combine the exactitude of a Naturalist with the Passion of an obsessed lover." "Before we take to the sea, we walk on land... Before we create, we must understand..." Ernest Hemingway. "All fisherman are born honest, but they get over it." Humorist Ed Zorn.